Nearly 300 University of Southern Maine (USM) students, faculty and staff donated 1,200 hours of community service at the 9th annual Husky Day of Service on Friday, April 13. USM volunteers took part in projects at more than 20 organizations in the Greater Portland and Lewiston-Auburn areas, including the American Red Cross, Preble Street, Lots to Gardens, the Animal Refuge League of Greater Portland and the Maine Veterans Home, among several others. 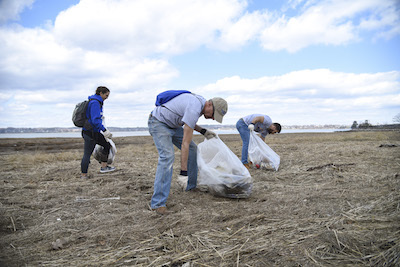 Staff and faculty volunteers could also be found along Portland’s Back Cove Trail, where, at low-tide, they removed several bags’ worth of waste from the shoreline. At the Portland Branch of the YMCA of Southern Maine, 40 students worked painting bookshelves and other common area items, as well as the walls of the center’s Men’s Dormitory, which at any given time houses 88 men coming out of homelessness. USM students Olivia Mayo and Paul Leger, painting hallways on the YMCA’s fifth floor, spoke to the importance of community service. Leger, who hails from Montreal, agreed, adding how proud he is to attend a community-engaged University. “We want to be proud of Portland, our city, and our school,” he said. YMCA of Southern Maine Chief Executive Officer Helen L. Breña said she and the organization look forward to hosting the Huskies for the Day of Service each year. This year’s volunteer totals surpass those from last year’s Husky Day of Service. In 2017, 292 volunteers from USM donated 876 hours of service with 21 local organizations. View photos of Husky Day of Service in Lewiston taken by Sun Journal photographer Andree Kehn.